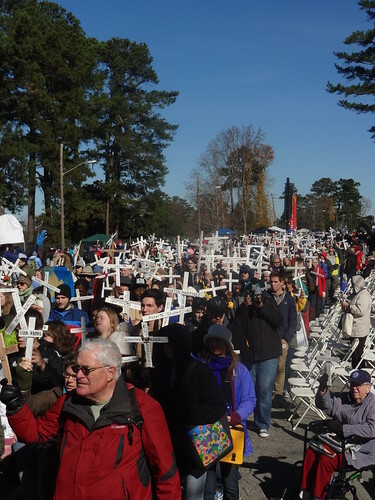 This year marked my fifth trip to Columbus, GA as a participant in the annual November vigil to close the School of the Americas. The vigil is a ritual to which I return year after year, and the familiar liturgy grows richer every year as it dialogues with my own constantly changing context and that of the world around me. The School of the Americas (now called WHINSEC) is a military training school located at Ft. Benning, GA which has been training Latin American soldiers since its establishment in Panama in 1946. It has been responsible for training many of the soldiers who perpetrated state-sponsored repression of popular movements, armed and unarmed, throughout Latin America, notably during the unrest of late twentieth century. The vigil falls every year on the weekend closest to the November 16th anniversary of the assassination of the martyrs of El Salvador’s Central American University: Jesuit priests Ignacio Ellacuría, Ignacio Martín-Baró, Segundo Montes, Juan Ramón Moreno, Joaquín López y López, and Amando López were killed along with their housekeeper Julia Elba Ramos and her daughter Celina by soldiers of the SOA-trained Atlacatl battalion. Despite the somber anniversary, the weekend consistently has left me feeling energized to work for justice, and so I return year after year. This past weekend, as I processed and danced, mourned and celebrated, I was reminded of the characteristics of the alternative community outlined by Walter Brueggemann in The Prophetic Imagination. Brueggemann draws parallels between our context today and that of the prophets of the Hebrew Scriptures: both reflect societies in which the “depreciation of memory and ridicule of hope”  have won the day. I am reminded of Johann Baptist Metz’s proclamation that we live in an age whose “eschaton is boredom, its mythos a faith in planning” . There are no surprises; there is little engagement with history. It is the vocation of the prophet, says Brueggemann, and the prophetic community, to break through the “numbness” with critical and energizing ministry: as ministers, we are called to remember and to hope, to look behind us critically and before us expectantly. Through ritual and bodily participation, this year’s vigil at the School of the Americas facilitated just this kind of prophetic ministry: the actions of mourning and celebrating for its several thousand attendees. Vigil-goers raise crosses during the solemn funeral procession. Photo copyright SOA Watch. Every year, the November vigil at Ft. Benning includes a symbolic funeral procession in which a litany of the names of those killed at the hands of SOA graduates is read. After each name, participants raise crosses, often bearing the name of a martyr, and chant, “¡Presente!”. Although they have died, they are risen in those who remember them. How often, Brueggemann observes, “we are tempted to legitimate the denial [of death] by offering crossless good news and a future well-being without a present anguish.”  At Ft. Benning, in remembering and raising the cross, we work to ensure that the good news is not construed as crossless. Moreover at the vigil, I am confronted with my own privilege and complicity even as I participate in resistance. Nevertheless through dance, art, and song, I am invited out of numbness and self-protection into the pathos of suffering. Caminando, caminando….vamos caminando hacia la paz. Walking, walking….we go walking toward peace. The message of hope arises from a doleful chant, as a reminder that hope cannot ignore sorrow. 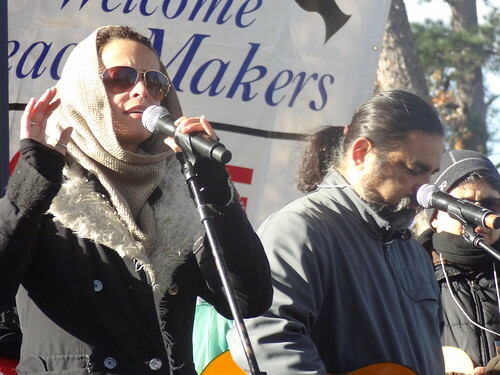 Leah Song of Rising Appalachia sings alongside Francisco Herrera. See a video of her arrangement of “Caminando” here. Photo copyright SOA Watch. At this year’s vigil, the funeral procession was followed by a procession of hope. At the end of the funeral procession, mourners lodged the crosses bearing victims’ names into the fence at the property line of Ft. Benning. The singers marked the change from mourning to hope by picking up the tempo of the “Presente” litany, migrating their harmonies from a minor key to an uplifting major key. When the assembly reached the gates of Ft. Benning for the second time, instead of affixing a cross in mourning, we blew bubbles that floated their way over the fence to the territory to which we were denied access. Finally, the puppetistas put on a work of public participatory theater in which we were drawn through dance and song into the drama of mourning and hope. In an age of endless war, the very act of demanding an end to war embodies a defiant act of hope which appeals to a truth more fundamental than that proclaimed by the royal consciousness. Death will not have the final word. For more information on the movement to close the School of the Americas/WHINSEC, see the School of the Americas Watch’s website. Walter Brueggemann, The Prophetic Imagination (Minneapolis, MN: Fortress Press, 2001), 41. Johann Baptist Metz, Faith in History and Society: Toward a Practical Fundamental Theology, trans. J. Matthew Ashley (New York, NY: Crossroad Publishing Company, 2007), 1.